RUSH: A friend of mine sent me something during the break that I have to show you. If you’re watching on the Dittocam, I can show you. We’re gonna put it in the switcher. You need to know about this. If you’re not watching on the Dittocam, you’ll be able to see this at RushLimbaugh.com once Koko works his magic with it. As you know, we’re in a fraughtful time, Facebook, Twitter doing everything they can to deemphasize conservatives on their websites to mischaracterize conservatives as hate-filled and dangerous and so forth and so on. It’s getting tougher and tougher for conservatives to have a presence. Well, apparently Apple is getting in on this game, warning people who use their internet browser, Safari, if they are trafficking in deceptive websites. Now, from the alert there, it looks like that’s an iOS, which would be an iPad or iPhone alert, as opposed to something that would happen on a PC or a Mac. Now, why would RushLimbaugh.com be considered deceptive? We don’t lie to people here. We don’t make things up. We don’t traffic in things that are exclusive to the dark net. 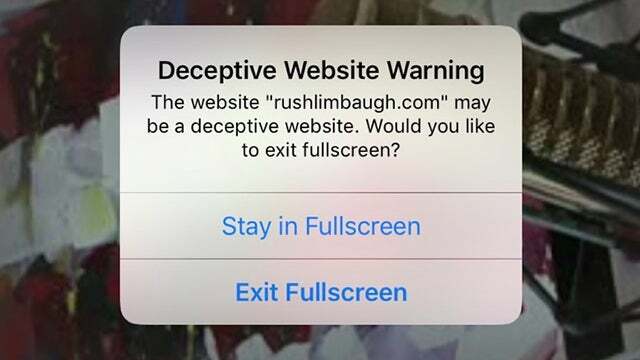 Why in the world would something about RushLimbaugh.com be considered deceptive? Well, I guess it would be a bunch of liberals making the judgment. And what would be deceptive, I guess, is the conservatism. I don’t know. Giving them the benefit of the doubt, maybe they think there’s something with the build of the website that makes it deceptive, maybe the cookies or something like that, I don’t know. That would be giving the benefit of the doubt. That is disappointing. But I had to show this. Here’s the thing. If you use an iPad or an iPhone and the Safari browser to access RushLimbaugh.com, and I guess even in the app you could go that route. If you get that alert, ignore it. We’re not doing anything deceptive. We’re not stealing information about you. We’re not selling invisible cookies and trying to track you. We don’t do that. We’re a subscriber-based site. Much of what we have is behind a pay wall. So feel free to ignore that if you encounter it. The friend who sent me this automatically assumed that it was political bias that caused somebody to put that alert up there. RUSH: So I just logged into the Dittocam on the Safari website on my iPhone running the same operating system as my buddy who sent me that email. The alert does not reproduce for me. So my website is not telling me that it is deceptive. (chuckles) Now, deceptive, ’cause I… Look, not much more time on this, but just in case: If you go to RushLimbaugh.com — if you go to the website, go to RushLimbaugh.com — and try to watch the Dittocam there, that’s where my buddy got an alert saying it’s potentially, what, a deceptive website and the alert? “Do you want to stay full screen? Do you want to exit full screen?” Now, “deceptive” could mean many things. I doubt that it means… I really doubt that it means that they think I’m a deceitful guy because I’m a conservative. It could! I mean, as far gone as the left is in tech, it could. But I really don’t think that’s what it is. I think they’ve got the idea that we’re doing strange things to steal certain amounts of data from our users without the users knowing it, kind of like Google does. Google just Hoovers up every bit of user data they can because they sell advertising based on it. So that’s probably what “deceptive” means here is that we are fooling you and capturing more information… We’re not, folks, and the alert doesn’t say we are. It says we “may be.” But we’re not. That’s not at all what we do. RushLimbaugh.com has no interest in any of that. I’m not gonna get into why, but let’s just say it’s not in our business plan. You are not the product. You are the customer. And, as such, it’s not how we see you. It’s just the furthest thing away from the way we design the website and the way it interacts with people who use it. So if you get that alert, just ignore it because there’s nothing deceptive. We’re not deceiving you at all.